Those yellow tanks built for hauling around loads of screaming schoolchildren have been repurposed by enterprising souls into everything from food trucks to RVs, toy haulers to permanent houses; but here is one use you might not have seen before. 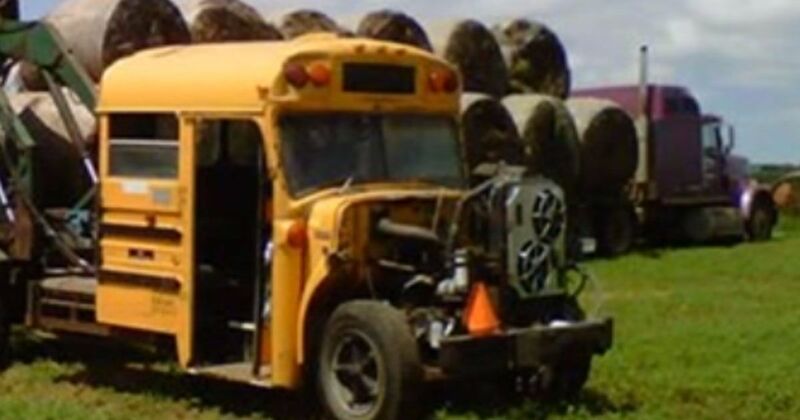 Dallas Henry of Highmore South Dakota turned his recently purchased school bus into something a little less traditional – a hay loader. The unholy combination of a used yellow school bus married to the corpse of a versatile 4WD tractor, the 1988 Frankenstein sports a 7.3L diesel, 4-speed Allison automatic transmission, an artsway loader, and tractor underpinnings. 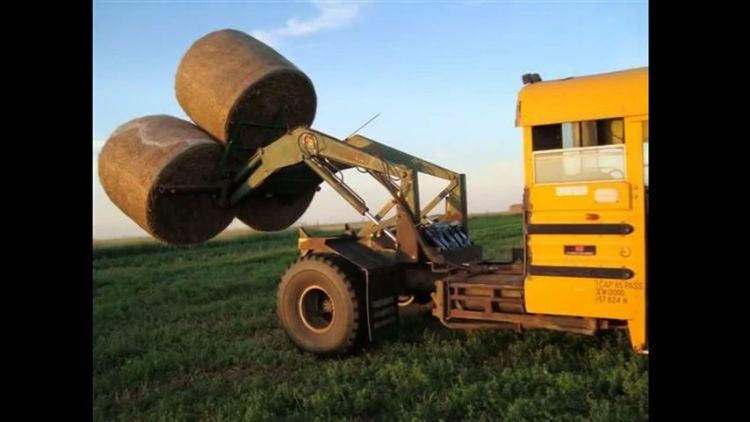 Capable of easily lifting, stacking, and moving up to three of the 1000-pound bales, this hybrid bus tractor spends its summer and fall days tooling around the farm, helping get the hay in before the brutal cold of a South Dakota winter hits. Capable of running at nearly 40 mph (20 mph when fully loaded according to Agricultural Machinery), the tractor bus makes short work of any task thrown at it and is more than capable of pulling its own weight when other jobs are required of it. Machinery Pete has a knack for sussing out and showcasing some the coolest and oddest equipment out there, and this working farm bus certainly fits the bill. You can see this customized school bus getting the job done in the video below. Please SHARE if you're a fan of re-purposed vehicles.